I spent the majority of the day worried that my treasured iTunes library with all its organized playlists had disappeared forever. I spent two hours with Apple support and an equal amount of time beforehand in chat rooms and reading troubleshooting links trying to avoid Apple support. Of course I backup my Mac regularly like any responsible person who stores thousands of songs and family photos on her computer should so it shouldn’t have been a problem, right? I diligently backup like every 8 months or so. I wasted the evening away desperately searching for a way to not have to go back to July of 2013 to replace the playlists. Early on in the process I was able to recover the music, but not the playlists. There was a point where I nearly gave up and accepted that it was enough to have all my music even if it wasn’t organized neatly in a slew of lists that together represent a chronological and musical expression of my entire being since I became an Apple user. These playlists mark so many phases of my life. 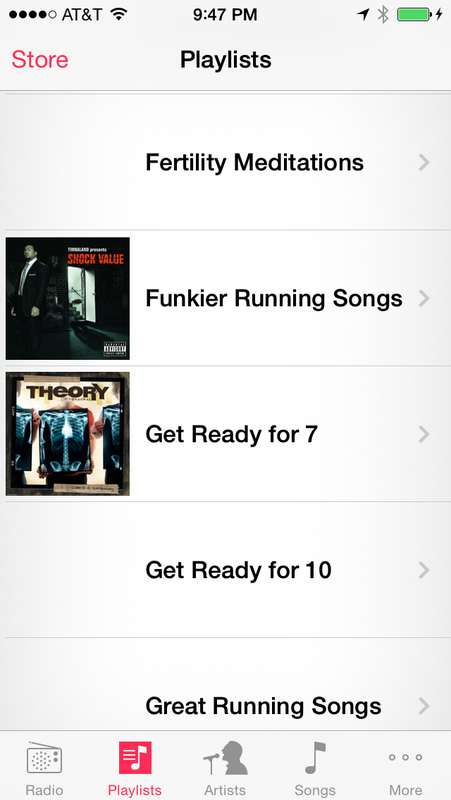 As a runner, I have playlists for certain distances that I run. For a short time today, the playlist that kept me company for nearly (but not quite!) four hours during my first marathon was lost. And there was so much more, like the first lullaby list I made Spork and countless playlists I have created as gifts for special people at special times. And let’s not forget my myriad fertility playlists with meditations and music put together in collections designed for specific stages of the IVF process. All were gone for this short but panicked period of time. I have mentioned before that I am Type A. This is why I have playlists that are the perfect length with just the right BPM to cover 5, 7, or 10 mile training runs. This is why I have multiple fertility playlists. This is why I spent the better part of the evening turning over every cyber rock I could find to determine how to get these playlists restored without losing a single song. It wasn’t easy, but I did it. I won. In the fertility world, this type of behavior makes me a cliche. I am about to embark on my fifth IVF because I waited too damn long to start trying to get pregnant. I had a world to conquer, a career to develop, and a Master’s degree to complete before I could even fathom making babies. When I finally got serious at 34, we discovered that baby making was going to require more effort than all of these things combined. So its no surprise that like a lot of women I try to exert as much control over the process as humanly possible. I do this despite knowing that IVF is a process that you simply cannot control. I have written before on the importance of acceptance and I believe fully in the mental benefit of being at peace with the fact that there is very little you can do to control or change infertility. I fall short, however of relinquishing all control. There are certain things you can influence in IVF and as with other things in life I choose to live by the rules of the Serenity Prayer, letting go of those things I can’t control and controlling what I can. There is so much with infertility that we have no ability to impact. Ultimately I cannot control whether we will have another baby or not. But I think its necessary to recognize that you can influence certain aspects and do your best in the process. There are things you can control. Many things. I can make sure I take my shots on time and schedule my meds to arrive when I need them. I can control how I manage stress. I can control my weight. I can control my nutrition and exercise regimen. I can control my quality of care by being an educated patient who asks questions and advocates for myself. This is why we are taking an ungodly number of supplements. Its one tiny little thing that we can do to improve our odds of success. Each and every single one has some added benefit that in one study or another led to increased success rates. Every item on the list has been vetted by one of the best clinics in the country and they believe it could have a positive impact. So why not take them? I do, however, think its a good idea to keep our ability to directly influence the outcome in perspective. My eggs have been with me since birth and we are having trouble because they are getting old and sticky, no longer dividing cleanly and quickly. All the Coq10 in the world is not going to reverse the impacts of aging. However we have noticed a difference in our lab tests and our actual cycles since starting this regimen last year. My resting follicle count increased and our embryo production improved by 26% (22 resting follicles produced an additional three embryos). Bill’s count and motility were always good, but his morphology improved from the very low end of the range to the high end of the normal range in the last two specimens since starting the supplements. So yes, the crazy number of supplements are probably an exercise in exerting control over infertility. But I don’t think that’s bad nor do I feel its futile. If it creates that one super healthy sperm that unites with that one magical and nutritionally nurtured egg to make a perfect little baby it will have been worth it. I can’t change who I am any more than I can change the fact that we are infertile. It’s in my nature to try to control and influence. My DNA doesn’t allow me to give up without a fight. But I have at least learned to not allow the ability to control give me the false sense of responsibility when a cycle fails. That is the risk you run with trying to control infertility. If you accept that you can make a difference, then it is all too easy to make the mental leap that you are to blame when things don’t go well. You cannot blame yourself when things go badly. What you did still may have had a positive impact, it doesn’t mean you did something wrong any more than it means you should stop trying to make a difference. Just pick yourself up, dust yourself off, pop a few more supplements, be compassionate with yourself and proceed to Plan B. 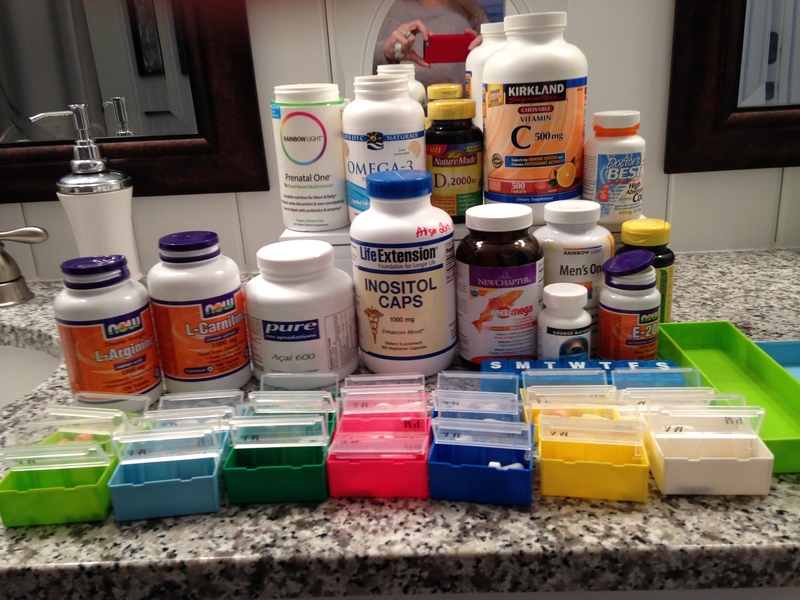 Hey lady- I just posted a new post with his supplements. It was on my to do list… sorry it took so long. Hah, I just saw that and was commenting on it when this popped up. Thanks. I should add- there aren’t specific purposes for any of the supplements. Some are for general and immune health (vitamin c, omega threes), others are antioxidant which helps with cell development (pycogenol, acai berry). All are for general health and fertility. I know zinc has been linked to sperm health. I’ve been looking into vitex and maca. I see that you guys have chosen not to go that route. I have generally decided to avoid herbs. Not enough is known. Maca has some contraindications. I am not familiar with vitex.